It's a classic. Traditional fisherman-stitch patterns are adapted to create this handsome pillow, October's Knit Project of the Month. Perfect on your favorite sofa and large enough to use as a floor pillow. 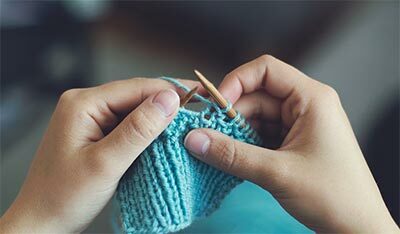 The following pattern makes one, 24" by 24" knitted square, which is finished off with two rows of single crochet, and then attached by sewing to a finished pillow. 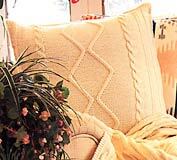 If you prefer to make a completely knitted pillow, knit two panels. 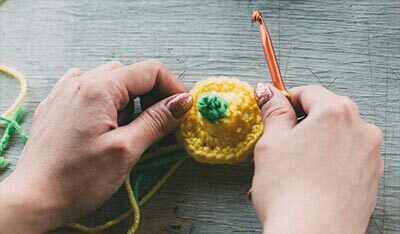 Join the two knitted squares on three sides with single crochet stitches, following the pattern finishing information; slip in a pillow form; then complete joining the squares with single crochet stitches. 4-ply worsted weight yarn&shy10.5 ozs. Right Twist: Slip 1 stitch to cable needle, hold in back, knit (k) 1, purl (p) 1, knit 1; then purl 1 from the cable needle. Left Twist: Slip 3 stitches to cable needle, hold in front, purl 1, then knit 1, purl 1, knit 1 from cable needle. Row 1: Right side. P22, (k1, p1) repeat everything within parentheses for 3 times, k 1 p22. Row 2: K22 (p1, k1) 3 times, p1, k22. Row 3: P21, Right Twist, p1. Left Twist, p21. Row 4: K21, p1, k1, p1, k3, p1, k1, p1, k 21. Row 5: P20, Right Twist, p3, Left Twist, p20. Row 6: K20, p1, k1, p1, k5, p1, k1, p2, k20. Row 7: P 19, Right Twist, p5, Left Twist, p19. Row 8: K19, p1, k1, p1, k7, p1, k1, p1, k19. Row 9: P18, Right Twist, p7, Left Twist, p18. Row 10: K18, p1, k1, p1, k9, p1, k1, p1, k18. Row 11: P17, Right Twist, p9, Left Twist, p17. Row 12: K17, p1, k1, p1, k11, p1, k1, p1, k17. Row 13: P16, Right Twist, p11, Left Twist, P16. Row 14: K16, p1, k1, p1, k13, p1, k1, p1, k16. Row 15: P15, Right Twist, p13, Left Twist, p15. Row 16: K15, p1, k1, p1, k15, p1, k1, p1, k15. Row 17: P14, Right Twist, p15, Left Twist, p14. Row 18: K14, p1, k1, p1, k17, p1, k1, p1, k14. Row 19: P13, Right Twist, p17, Left Twist, p13. Row 20: K13, p1, k1, p1, k19, p1, k1, p1, k13. Row 21: P12, Right Twist, p19, Left Twist, p12. Row 22: K12, p1, k1, p1, k21, p1, k1, p1, k12. Row 23: P11, Right Twist, p21, Left Twist, p11. Row 24: K11, p1, k1, p1, k23, p1, k1, p1, k11. Row 25: P10, Right Twist, p23, Left Twist, p10. Row 26: K10, p1, k1, p1, k25, p1, k1, p1, k10. Row 27: P10, Left Twist, p23, Right Twist, p10. Row 28: K11, p1, k1, p1, k23, p1, k1, p1, k11. Row 29: P11, Left Twist, p21, Right Twist, p11. Row 30: K12, p1, k1, p1, k21, p1, k1, p1, k12. Row 31: P12, Left Twist, p19, Right Twist, p12. Row 32: K13, p1, k1, p1, k19, p1, k1, p1, k13. Row 33: P13, Left Twist, p17, Right Twist, p13. Row 34: k14, p1, k1, p1, k17, p1, k1, p1, k14. Row 35: P14, Left Twist, p15, Right Twist, p14. Row 36: K15, p1, k1, p1, k15, p1, k1, p1, k15. Row 37: P15, Left Twist, p13, Right Twist, p15. Row 38: K16, p1, k1, p1, k13, p1, k1, p1, k16. Row 39: P16, Left Twist, p11, Right Twist, p16. Row 40: K17, p1, k1, p1, k11, p1, k1. p1, k17. Row 41: P17, Left Twist, p9, Right Twist, p17. Row 42: K18, p1, k1, p1, k9, p1, k1, p1, k18. Row 43: P18, Left Twist, p7, Right Twist, p18. Row 44: K19, p1, k1, p1, k7, p1, k1, p1, k19. Row 45: P19, Left Twist, p5 Right Twist, p19. Row 46: K20, p1, k1, p1, k5, p1, k1, p1, k20. Row 47: P20, Left Twist, p3, Right Twist, p20. Row 48: K21, p1, k1, p1, k3, p1, k1, p1, k21. Row 49: P21, Left Twist, p1, Right Twist, p21. Row 50: K22, (p1, k1) 3 times, p1, k22. Repeat Row 3 through 50 for Center Panel. Work until there are 4 complete diamonds, ending with Row 50. Repeat Rows 3 and 4. P1 row on right side. Bind off as to knit. Right side. (Purl 4, knit 2) 2 times (this means that everything within the parentheses is to be repeated 2 times), purl (p) 6, knit (k) 6. Rows 2, 4, 6, 8, 10, 12, 14: P6, k6, (p2, k4) 2 times. Rows 5 and 15: (P4, k2) 2 times, p6, slip next 3 stitches to cable needle, hold in front, k3, k3 from cable needle (called a cable twist). Repeat Rows 6 through 15 for Side Panel 1. Right side, k 6, p6, (k2, p4)2 times. (k4, p2) 2 times, k6, p6. Cable twist over 6 stitches, p6, (k2, p4) 2 times. Repeat Rows 6 through 15 for Side Panel 2. Cast on 99 stitches. K 1 row. Set up patterns as follows — Row 1: Right side. Work 24 stitches Side Panel 1; place a marker; work 51 stitches in Center Panel Pattern; place a marker; work 24 stitches in Side Panel 2. Work even in patterns as established until you have 3 complete diamonds in center, ending with Row 50. Continue Side panels as established and on Center Panel work Rows 3 and 4. Purl 1 row across all 99 stitches on right side. Bind off as to knit. Note: To measure approximately 24". Round 1 — With I hook, right side facing, work single crochet around all sides of pillow, working 3 single crochet in each corner, keeping work flat and making sure corresponding sides have same number of stitches. Round 2 — With right side facing, working backwards from left to right, work a single crochet in each stitch. Join with a slip stitch. Fasten off. Sew to pillow form or see comments at the beginning of the pattern.